This is just two one hour visits with a one year old. This beach is amazing but the surf is strong! 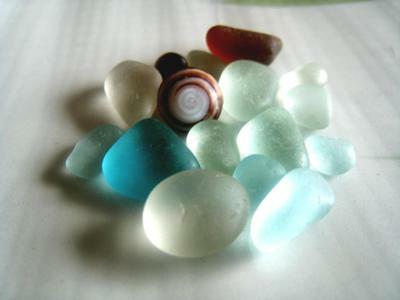 The sea glass is everywhere and just continues washing in with every wave. I took two friends with me and they collected a little more sea glass then I did. A friend was visiting me from the Mainland and here are some tiny lovelies that I collected during a visit to my favorite secret bay. This special photo.